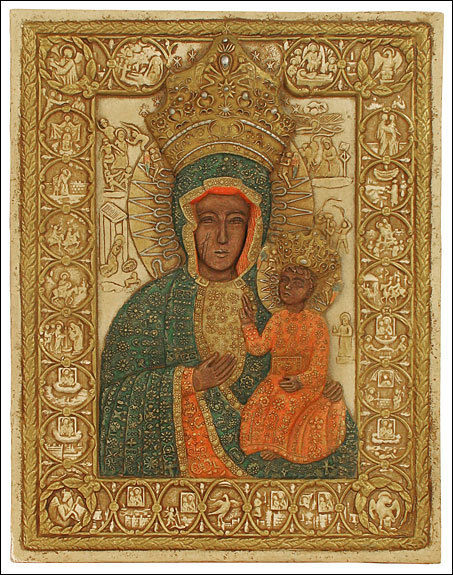 Black Madonna of Czestochowa, Black Madonna, Black Madonna icons, Icons. Tradition tell us that St. Luke painted it on top of a cypress wood table from the home of the Holy Family. Mary sat for the portrait and was so pleased by it that she said, �My grace shall accompany it�. The painting was later brought to Constantinople and several centuries later it was given to a nobleman from Kiev. In 1382 the neck in the painting was pierced by an invading Tartar�s arrow. Concerned with its safety, Prince Ladislaus Opolski decided to move it to a safer location; but the horses carrying the wagon with the painting suddenly stopped on a hill called Jasna Gora (Brigh hill) and nothing could make them move. Mary appeared to Ladislaus and told him that this was to be her new home. The recorded history of miracles surrounding the painting began in 1382 when it began to protect Poland from successive invading armies. The monastery of Jasna Gora became a monastic fortress and Our Lady of Czestochowa was crowned as Queen of Poland in 1430. Once, Hussites sacked the monastery, seized the painting and set off in their wagons. But the horses wouldn�t budge. A hussite then threw the painting from the wagon and slashed it twice with his sword into the right cheek of Mary. When he went to strike it for a third time, he fell dead. Repeated efforts by artists to patch the scars failed since the facial cuts reappeared every time. The Black Madonna nickname refers to the dark skin colors caused by 2000 years of libations of incense and candles as well as from the major fire it was in during its years in Constantinople.